Distributed generation, also distributed energy, on-site generation (OSG) or district/decentralized energy is generated or stored by a variety of small, grid-connected devices referred to as distributed energy resources (DER) or distributed energy resource systems. Conventional power stations, such as coal-fired, gas and nuclear powered plants, as well as hydroelectric dams and large-scale solar power stations, are centralized and often require electricity to be transmitted over long distances. By contrast, DER systems are decentralized, modular and more flexible technologies, that are located close to the load they serve, albeit having capacities of only 10 megawatts (MW) or less. These systems can comprise multiple generation and storage components. In this instance they are referred to as Hybrid power systems. DER systems typically use renewable energy sources, including small hydro, biomass, biogas, solar power, wind power, and geothermal power, and increasingly play an important role for the electric power distribution system. A grid-connected device for electricity storage can also be classified as a DER system, and is often called a distributed energy storage system (DESS). By means of an interface, DER systems can be managed and coordinated within a smart grid. Distributed generation and storage enables collection of energy from many sources and may lower environmental impacts and improve security of supply. Microgrids are modern, localized, small-scale grids, contrary to the traditional, centralized electricity grid (macrogrid). Microgrids can disconnect from the centralized grid and operate autonomously, strengthen grid resilience and help mitigate grid disturbances. They are typically low-voltage AC grids, often use diesel generators, and are installed by the community they serve. Microgrids increasingly employ a mixture of different distributed energy resources, such as solar hybrid power systems, which reduce the amount of emitted carbon significantly. Typical DER systems in a feed-in tariff (FIT) scheme have low maintenance, low pollution and high efficiencies. In the past, these traits required dedicated operating engineers and large complex plants to reduce pollution. However, modern embedded systems can provide these traits with automated operation and renewables, such as sunlight, wind and geothermal. This reduces the size of power plant that can show a profit. Delta-ee consultants stated in 2013 that with 64% of global sales the fuel cell micro combined heat and power passed the conventional systems in sales in 2012. 20.000 units were sold in Japan in 2012 overall within the Ene Farm project. With a Lifetime of around 60,000 hours. For PEM fuel cell units, which shut down at night, this equates to an estimated lifetime of between ten and fifteen years. For a price of $22,600 before installation. For 2013 a state subsidy for 50,000 units is in place. As most renewable energy sources and unlike coal and nuclear, solar PV is variable and non-dispatchable, but has no fuel costs, operating pollution,as well as greatly reduced mining-safety and operating-safety issues. It produces peak power around local noon each day and its capacity factor is around 20 percent. 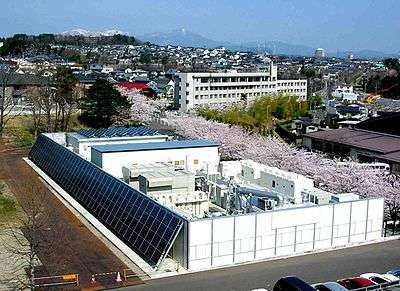 A microgrid is a localized grouping of electricity generation, energy storage, and loads that normally operates connected to a traditional centralized grid (macrogrid). This single point of common coupling with the macrogrid can be disconnected. The microgrid can then function autonomously. Generation and loads in a microgrid are usually interconnected at low voltage and it can operate in DC, AC or the combination of both. According to the recent developments in renewable energy systems, storage systems, and the nature of newly emerging loads, there have been some researches for comparing the efficiency and performance of AC and DC microgrids. From the point of view of the grid operator, a connected microgrid can be controlled as if it were one entity. IEC 61850-7-420 is under development as a part of IEC 61850 standards, which deals with the complete object models as required for DER systems. It uses communication services mapped to MMS as per IEC 61850-8-1 standard. ↑ "On Site Generation: Learn more about our onsite renewable energy generation technologies". E.ON SE. Retrieved 17 December 2015. 1 2 DOE; The Potential Benefits of Distributed Generation and Rate-Related Issues that May Impede Their Expansion; 2007. ↑ Kunal K. Shah, Aishwarya S. Mundada, Joshua M. Pearce. Performance of U.S. hybrid distributed energy systems: Solar photovoltaic, battery and combined heat and power. Energy Conversion and Management 105, pp. 71–80 (2015). ↑ "Heiß auf kalt". Retrieved 15 May 2015. ↑ "Photovoltaics Report" (PDF). Fraunhofer ISE. 28 July 2014. Archived from the original on 31 August 2014. Retrieved 31 August 2014. ↑ Parkinson, Giles (7 January 2014). "Deutsche Bank predicts second solar "gold-rush"". REnewEconomy. Archived from the original on 14 September 2014. Retrieved 14 September 2014. ↑ "NREL: Energy Analysis - Distributed Generation Energy Technology Capital Costs". www.nrel.gov. Retrieved 2015-10-31. ↑ "Energy VPN Blog". Retrieved 15 May 2015. ↑ Castelvecchi, Davide (May 19, 2007). "Spinning into control: High-tech reincarnations of an ancient way of storing energy". Science News. 171 (20): 312–313. doi:10.1002/scin.2007.5591712010. ↑ Agalgaonkar, Y.P. ; et. al (16 September 2013). "Distribution Voltage Control Considering the Impact of PV Generation on Tap Changers and Autonomous Regulators". Power Systems, IEEE Transactions on. 29 (1): 182–192. doi:10.1109/TPWRS.2013.2279721. Retrieved 29 April 2015. ↑ "What the Duck Curve Tells Us About Managing A Green Grid" (PDF). caiso.com. California ISO. Retrieved 29 April 2015. ↑ Lazarewicz, Matthew; Rojas, Alex (10 June 2004). "Grid Frequency Regulation by Recycling Electrical Energy in Flywheels". Power Engineering Society General Meeting: 2038–2042. Retrieved 29 April 2015. ↑ Lazar, Jim. "Teaching the "Duck" to Fly" (PDF). RAP. Retrieved 29 April 2015. ↑ "How big are Power line losses?". Schneider Electric Blog. Retrieved 15 May 2015. ↑ Seyedmahmoudian, M.; Arrisoy, H.; Kavalchuk, I.; Oo, A. Maung; Stojcevski, A. "Rationale for the use of DC microgrids: feasibility, efficiency and protection analysis". Energy and Sustainability V: Special Contributions. doi:10.2495/ess140061. 1 2 "Power crisis and grid collapse: Is it time to think". Retrieved 15 May 2015. ↑ "US Microgrid Capacity Will Exceed 1.8GW by 2018". Retrieved 15 May 2015.